We wanted to take a moment to share some exciting news about our first mobile game, Elemental Kingdoms. If you're interested in competitive gaming, and have an iOS device, we'd love to play against you in our upcoming Thanksgiving Tournament of Champions! Starting on Thursday, November 21st, gamers can compete to win $1,000 in Zen and other prizes. The event ends on Tuesday, December 3rd. Phase One of the tournament runs from Thursday, November 21st to Wednesday, November 27th. During this time, all challengers must reach level 11 and unlock the “Arena” to compete in player versus player. Every user who unlocks the “Arena” will receive the NEW 4 star Therapod card and can compete in Phase Two. Phase Two runs from Thursday, November 28th to Tuesday, December 3rd. During this time, users duel challengers in the Arena and compete in ranked matches. Only those with the skill and strength to accumulate the most ranked match wins will be crowned the champ. 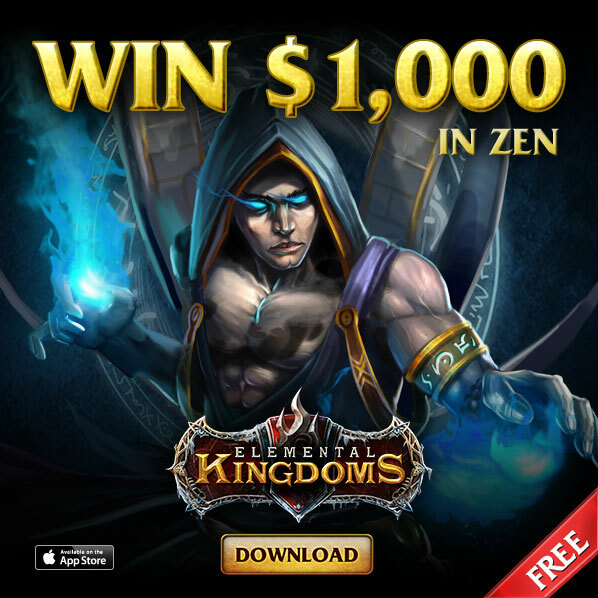 In order to participate, download Elemental Kingdoms from the Apple App Store. Sign into Elemental Kingdoms with a registered Arc ID or through Facebook login. (Note: users using the “Guest login” will not be eligible to win). Prizes will be awarded based on the player versus player leaderboard ranking during the event. The Elemental Kingdoms team will contact each winner individually. In addition, all players can win fire tokens based on the number of ranked matches they play.